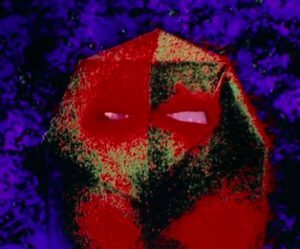 The Tholian Web is a fondly remembered character episode with some award winning visuals and elements of psychological and gothic horror. In this episode of Whom Pods Destroy, Graham, Terry and Derek celebrate this third season episode. 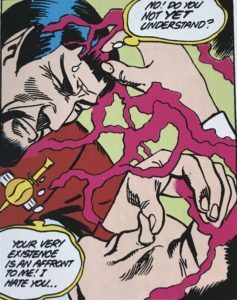 They also revel in the great character moments between Spock and McCoy in the episode where Kirk is largely absent but his shadow looms large. We also contemplate the Scotty’s by now apparent alcoholism. We are a sucker for unpopular episodes of the original series here at Whom Pods Destroy and they are seldom less popular than The Alternative Factor. However, our last two episode have explored parallel universes so we thought that it would be a good opportunity to explore this often forgotten first season episode since it plays around with the notion of alternative dimensions. Of course there are worse episodes than The Alternative Factor but not much worse. However, the show was beset with a number of production problems which we discuss while trying to some any positives in the story. Following on from our previous podcast on Mirror, Mirror – Graham, Terry and Derek discuss its legacy and the nature of parallel universes and alternate timelines not just in Star Trek but in other Science Fiction. We also celebrate the numerous sequels to this classic episode whether they be canon, side canon and non canon. So we’re talking Fan films, DC Comics, Dark Mirror by Diane Duane, Deep Space 9, Enterprise and Discovery. Please note there will be spoilers. This podcast is also notable for a world class impression of the Grand Nagus. 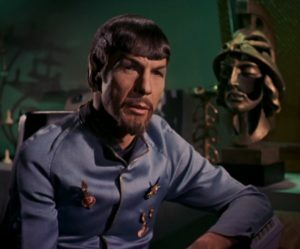 Mirror, Mirror is one of the most popular and enduring Star Trek stories. Its visual and narrative legacy has lasted all the way through to the modern day Star Trek. In this episode of Whom Pods Destroy, Graham, Derek and Terry celebrate this fantastic episode of the original series and discuss its finer points including the nature of interdimensional travel. Did the Enterprise landing party transport into their counterpart’s underwear or was it a more hygienic case of mind transference?